It was an arduous journey to the Turtle Islands from Freetown and involved four hours in a small, open boat powered by an out-board engine. My husband, Steve, and I sat at the front of the boat with our companion Eddie. The boat ride was smooth enough but very hot with no canopy to shade us from the sun. Fortunately, we had our hats and plenty of sun lotion as protection and lots of water. Apart from the open ocean, there wasn’t much to see until we got closer to the islands where we passed several traditional fishermen in their colourful dug-outs. After sitting on a wooden plank for the duration of the trip, we were pretty relieved to jump out and paddle to shore when we arrived at Nyangai, our destination island. Our trip had come about through a friend of ours who had been living in Sierra Leone and working at the Tacugama Chimpanzee Sanctuary in Freetown. We were keen to visit and get to know a little of the country’s culture and history. We were also keen to learn about some of the charitable projects being run in the country, and find opportunities for contributing. Given our interest in environmental issues, our friend had recommended a trip to the Turtle Islands and introduced us to Eddie Aruna, the founder and managing director of an environmental NGO known as the Reptile and Amphibian Program, Sierra Leone (RAP-SL). 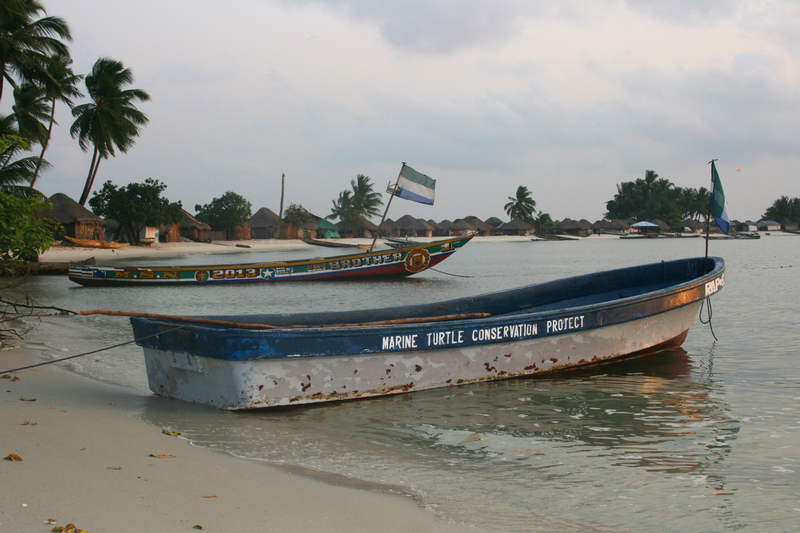 The organisation runs turtle conservation projects in various coastal areas, including the Turtle Islands. Eddie invited us to visit one of his projects and helped to organise the logistics for our trip there. Visitors to the islands are limited due, in part, to the high cost of hiring boats from Freetown and the absence of tourist facilities. Although RAP-SL does not organise tours, it does sometimes facilitate trips for those with an interest in environmental and educational projects. In most cases, Eddie is required to seek the consent of the local chiefs on the islands before organising trips for visitors. Our arrival was greeted with some initial curiosity by the island’s inhabitants, but they were very hospitable and made us feel immediately welcome. Our first stop was to meet the Chief of Nyangai. We had been told that there was no electricity on the island and had brought with us a large wind-up lamp to present to the chief, and it was well received. As our trip would only be a short one, we had taken only the minimum of clothing and essentials. We did, however, bring our snorkelling masks and fins with us which we used in the beautiful warm waters off the shore. When we invited Eddie to join us, we discovered that he could not swim! We decided to give Eddie a few snorkelling lessons in some of the shallows around the island. He found it a little difficult at first but soon got the hang of it and enjoyed the wonders of being able to see creatures under the water. We left the island minus Steve’s snorkelling set, as a gift to Eddie which we hope will come in useful. 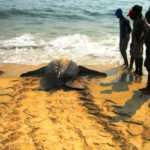 Among the projects run by RAP-SL is the sea turtle conservation project, funded by the US Fish and Wildlife Services (USFWS). 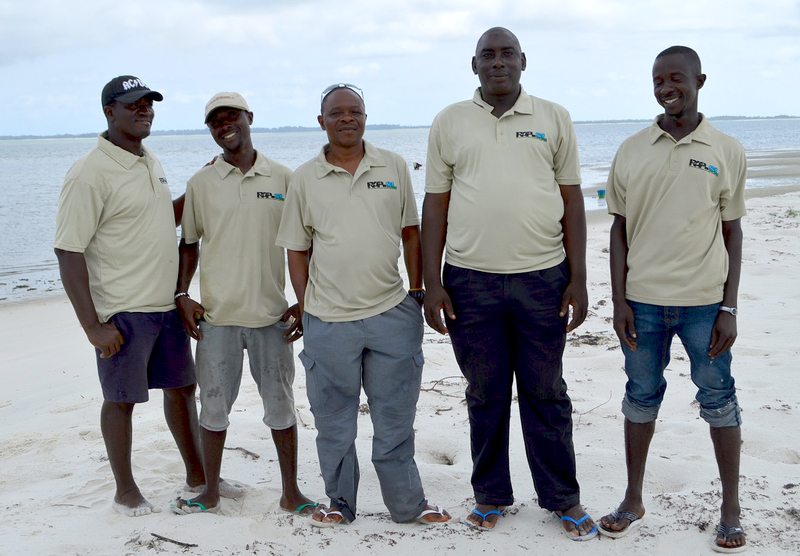 The project hires local people, including youths and fishermen, for the monitoring of bycatch and turtle nesting beaches. Additionally, the monitors undertake community education and awareness raising programmes. 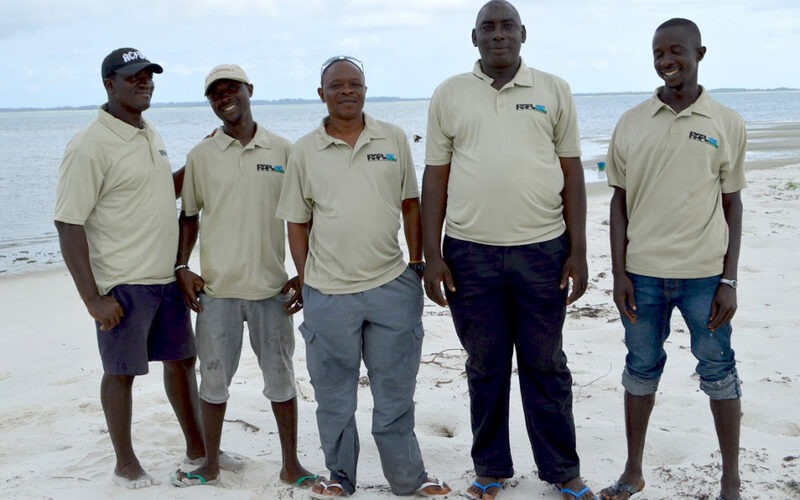 The monitoring efforts are conducted on six of the islands and generally include night and early morning patrols of nesting beaches in order to search for the trails of emerging nesting turtles, record number of nests and hatching activity. Hatchlings are counted and guarded as they make their way to the sea, and the old nest is excavated for hatching success determination. For bycatch monitoring, monitors are deployed at all major landing sites and have the responsibility of taking an inventory of all bycatches and releasing all live turtles back into the sea. If captured turtles are found dead, local bylaws require that they be buried. Data collected on all captured turtles include species, carapace length and width, and number of scutes on the carapace. An important part of RAP-SL’s work is to collect data and bridge the gap in information about Sierra Leone’s turtle population in order to support conservation and sustainable development programmes through site activities that will not only benefit the biodiversity of the country but also help improve living conditions of locals. 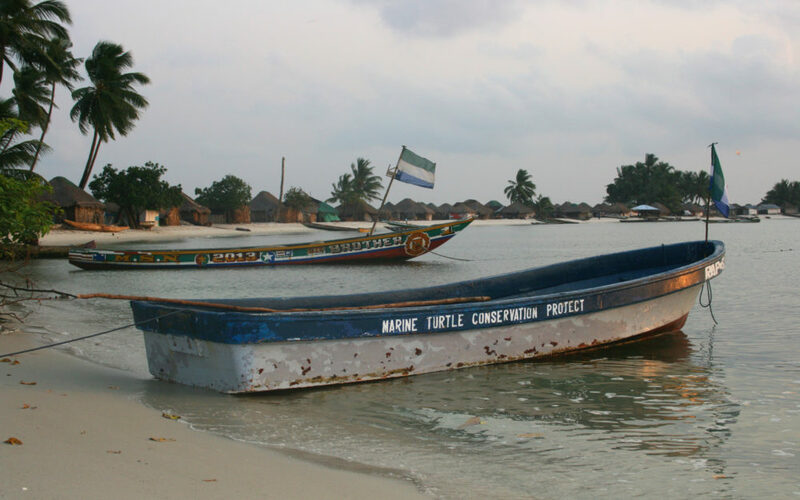 While RAP-SL has not had the resources to undertake a comprehensive turtle population census, it has recorded 1424 adult turtles in the bycatch effort of which 1079 were released and 345 buried. The nesting beach monitoring effort has resulted in the successful release of over 33,000 hatchlings. Whilst on Nyangai we learnt how the island is being affected by erosion. We could see stumps of coconut palms that have toppled over in recent years as the sea continues to encroach on the land. Villagers might soon be forced to consider where they will make new homes. At the end of our stay in Sierra Leone, we discussed with Eddie how we could provide some additional support to RAP-SL. One of the suggested outcomes was to provide uniforms to local staff. It was more about making the monitors feel part of a team and believing they were playing an important role in the continuing conservation of the turtles that are slowly returning to the islands in increasing numbers. As you can see from the photo, the team looks pretty happy with their smart uniforms! 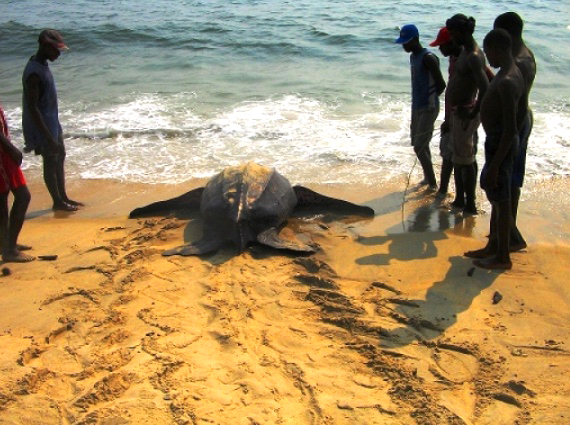 Main image: Leatherback Turtle © 2013 The Reptile and Amphibian Program — Sierra Leone.